New Zealand kept South Africa far away from their try line. The Springboks only socring came on six penalty kicks. 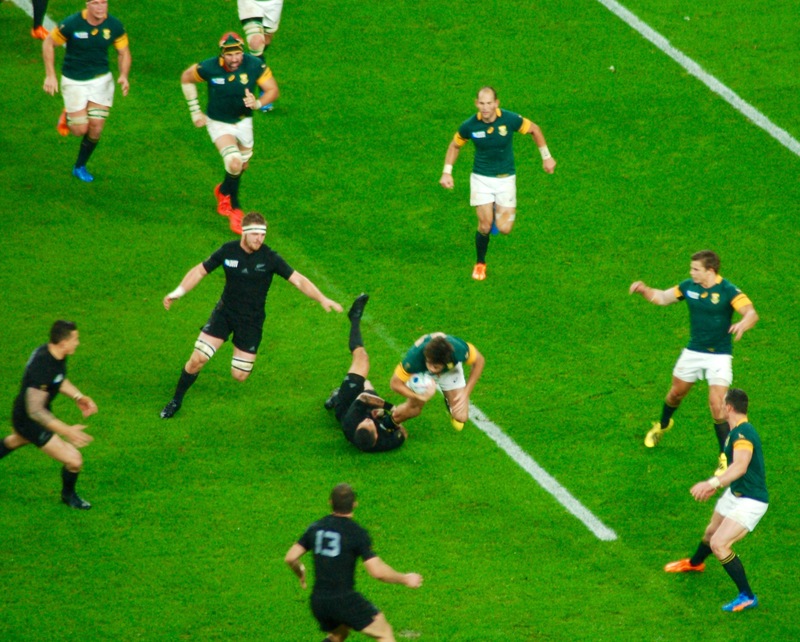 New Zealand had to use all ways of scoring to get ahead of South Africa early in the second half and then gradually inch just ahead of them to full time for a 20-18 win in the first semi final match of the Rugby World Cup 2015. That puts the All Blacks in the finals against the winner of tomorrow’s game between Australia and Argentina. All of South Africa’s scoring came on penalty kicks, five by Handre Pollard and one by Patrick Lambie. Posted on October 24, 2015 October 24, 2015 by jbsaulPosted in UncategorizedTagged All Blacks, New Zealand, Rugby World Cup, RWC, South Africa, Springboks.